Soak almonds in lukewarm water for about one hour and remove the pink skin. Grind the peeled almonds to a coarse paste using little milk. Take a thick bottomed kadai (preferably non-stick kadai). Put the sugar and the ground almond paste into it and then switch on the stove and keep it on medium flame. First the sugar starts melting and the mixture looks liquid. Stir continuously till it become solid and leaves the sides of the vessel. If you roll the paste in your hand it shouldn't stick. Then switch off the stove. 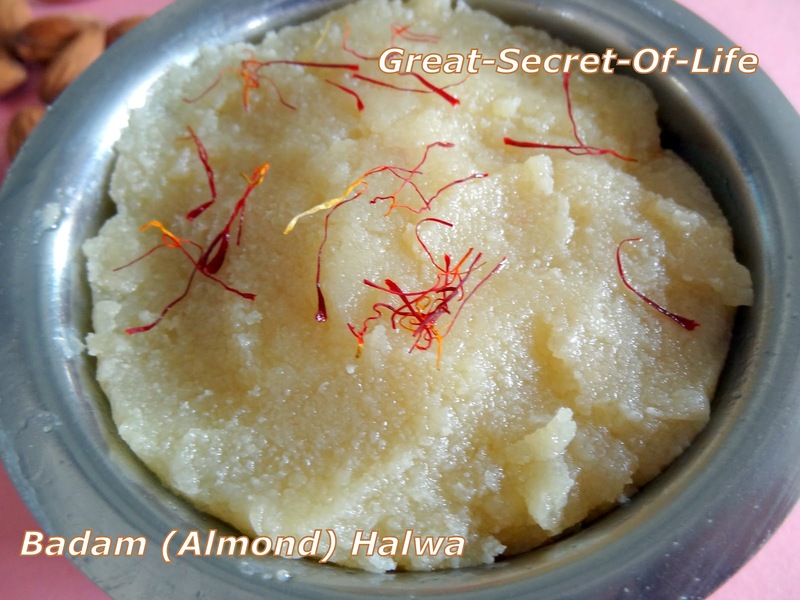 Add two tablespoon of ghee on the halwa. 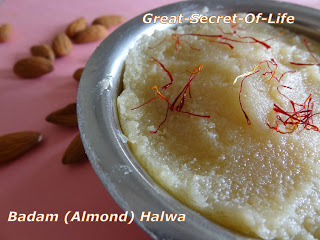 Ghee melt in the heat of the halwa. Add saffon and cardamom powder and mix everything. Now add the remaining ghee and once again mix well and transfer it to a greased bowl.